Thank you for visiting our listing. Hopefully our beach cottage will be a place you will enjoy as much as we do, whether in the summer when it’s warm and breezy, or during the cold and windy months as an adventure! Our “beach box”, as called on the Outer Banks, is a uniquely cute cottage large enough to accommodate an averaged sized family, yet small enough to give the simplicity and flavor of the area. It is located at the 10.5 Milepost just 2 neighborhood streets from the beach b/n the Beach Road and the 'bypass'. The beach access has space for approx 18 cars should you have more items than you can carry. We are dog friendly (upon approval) with just a few rules..... your dog must be on a vet prescribed flea and tick preventative, not get on the furniture or beds (even small breeds), and be clean and dry before re-entering the cottage after time on the beach. The cottage is set up in the carport to accommodate a doggy hose bath, and dry-time. Resembling a tiered wedding cake, the cottage is two floors. The second floor comprises the master bedroom with a king sized bed and a full bath with shower. The windows on all four walls provide a wonderful opportunity to enjoy the summer breezes while sleeping. The main floor offers 2 additional bedrooms, both with 2 twins. Both share a full bath with tub. Also on the main floor is an open space family room, dining area, and kitchen. The TimberTech deck wraps two sides of the cottage providing a great place to relax and read, eat meals at the outdoor table for 6, or just enjoy your morning coffee and afternoon sun. Most of the OBX beach boxes are above ground level. Ours is no different, so you will enjoy the hammock swing under the cottage, as well as covered space for two cars, and the laundry/storage room for convenience. But perhaps one of the best parts of your stay will be the private outdoor shower and dressing area. Everyone who tries it for the first time never returns inside to shower again! You will leave our cottage wishing you had one at home! Guests are requested to leave the cottage as good or better than you found it. There has never been a cleaning service in an attempt to keep the rate down. Cleaning supplies and a vacuum are provided, as well as a short list of simple clean-up jobs before you leave (such as Windexing all glass, vacuuming, bed making, bathrooms and kitchen sparkling, sweep deck and carport). Please let me know if this is something you can't do before you leave, and we can talk about options. With a career in sales as well as being a mom of 4 kids who grew up vacationing and working summers on the OBX, I enjoy nothing more than time at the beach cottage, whether it's for a weekend or a week. 'T-shirts and flip flops' are the attire for a guaranteed fun and relaxing stay in Nags Head. I love sharing the cottage with folks new to the Outer Banks, so others can experience the same enjoyments of the area as we do. Having grown up vacationing on the Outer Banks of North Carolina, I wanted to enjoy the small town beach atmosphere as a permanent part of my life. As you come over the bridge you can't help but take a deep breath and leave all stresses behind. A walk on the beach alongside the waves, or along the beach road is a get-away all your own. But there is plenty to do to make memories with family and friends when you get back! While staying at our simple beach cottage, enjoy the simplicity of walking to the grocery store and nearby shops, swinging in the hammock swing, enjoying dinner on the deck, and relishing the very private outdoor shower. If you want to venture out, you don't need to go far to enjoy various water sports, fishing, the Wright Museum, miniature golfing, and the quaint town of Manteo with the NC's Aquarium and antique shopping. For a day trip, enjoy a drive down Rte 12 to Hatteras and its historic lighthouse. The drive and views are breathtaking! outdoor shower, Lovely enclosed outdoor shower with dressing area. Please do not use insect repellant or spray sunscreen while standing on deck. These products are "plasticizers" and will permanently damage the decking material on contact. One of the unique features of this beach cottage is the outdoor shower and dressing area constructed for enjoying the breezes with total privacy. After trying it, rarely do guests shower indoors! Also to be enjoyed is the double hammock swing under the cottage. Guests enjoy the short walk to the grocery store and eateries in the neighborhood. Once arriving, throw your car keys away! Very nice location, 2 blocks from the beach. Carol was great to work with and cottage was great! This was our first visit to the OBX, we really enjoyed all of the nice beaches it had to offer. Our cottage had everything we needed to make our stay enjoyable! Great location for beach or store access. Clean, perfect size and very relaxing beach cottage. I really enjoyed our stay at your beach cottage. Everything was so convenient. The house was so nice and had everything you would need to have an amazing relaxing time at the beach! I didn’t want to leave! Love hearing you had a great week and enjoyed the cottage as much as we do. 'Amazing' and 'relaxing' is what it's all about! Family time at the beach is all about memories, and I'm always happy when my guests take some home with them! Perfect location, easy stroll to the beach and shopping. Owner was wonderful to work with. Great location with easy strolls to the beach, shopping and coffee houses! Great first time at the outer banks!! First time at the outer banks and we enjoyed every minute of our stay. Thank you Carol for opening up your home, it was perfect. We hope to do it again next year. Great house with a 5 minute walk to the beach and a 30 second walk to the grocery store. House was very clean and we loved the outside shower and under deck seating area. This was a dog-friendly home and you wouldn't even know it's so well take care of. Carol was so helpful and easy to work with. Made me feel very comfortable as a VRBO first time customer. 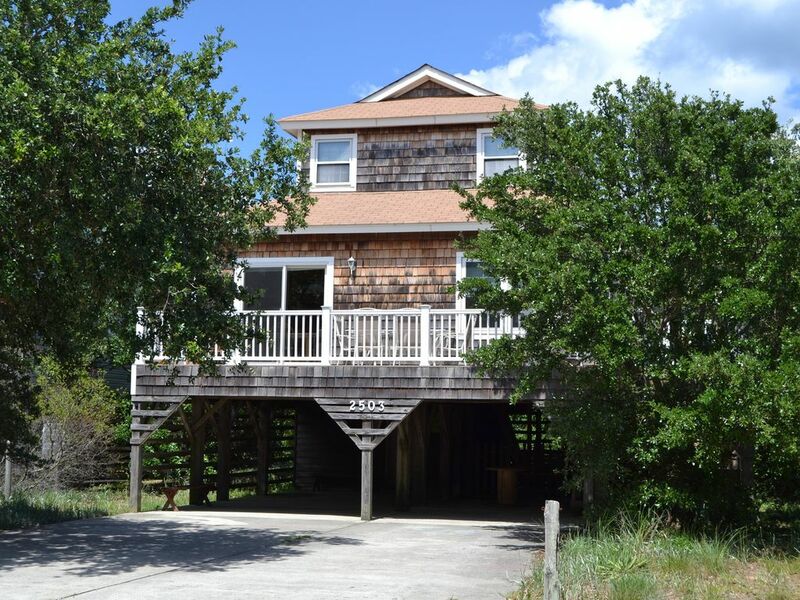 We would definitely recommend this house to anyone looking for a home in Nags Head. The house was as advertised and a short walk to the beach. It is located in a quiet neighborhood which makes relaxing a breeze. The house is also a stones throw from a Food Lion and a short drive to several very good restaurants. Thanks Cody for taking the time to write. I loved having you and Monica enjoy the cottage. When I arrived after you left, I found my favorite part of the cottage was not up to par..... the outdoor shower! I immediately unclogged the shower head but feel badly you probably did not get enjoyment out of it! My apologies. Hope to see you again next summer! The cottage is just a block from the walking/running path that parallels the beach, a great opportunity for those who want a leisurely stroll or run. This paved path stretches from the south end of Nags Head to the north end of Kill Devil Hills. A focus of this area are the beautiful beaches and relaxed family life without the neon and noise of large resort areas.